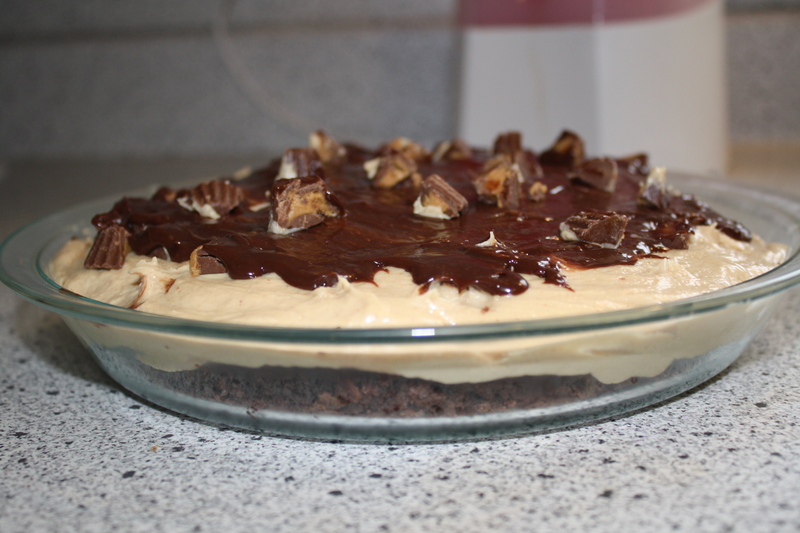 It has a dark chocolate brownie crust, peanut butter mousse filling, semi-sweet chocolate ganache topping and chopped Reese’s cups on top of that. Just a tip if you’re making it, allow yourself plenty of time to do it – it took me 2 1/2 hours to 3 hours to completely make it, because there are several times when the pie has to cool in the refrigerator and the time really adds up. Here’s the recipe. I actually found it online somewhere. Preheat oven to 350 degrees. Line the bottom of a round 9″ cake pan with greased parchment paper. Spray the sides of the pan with cooking spray. Place the chocolate and butter in a microwave safe bowl. Melt completely on 50% power at 30 second intervals, stirring after each. Cool slightly. Add the eggs to a mixing bowl. Next, add the vanilla, salt, sugar, and brown sugar to the bowl. Whisk thoroughly. Add the chocolate butter mixture and whisk again. Gently fold in the flour to the brownie batter until just combined. Over mixing will result in tough brownies. Pour the batter into the prepared cake pan. Place in the preheated oven for 20-25 minutes or until a toothpick inserted 3″ from the edge of pan comes out with only a few crumbs. Remove from oven and cool completely on a wire rack – at least one hour. To remove from pan, carefully slide a knife around the edges to loosen. Place a plate over the brownies then invert the pan. Brownies should easily flip out. Peel off parchment paper. While brownies are baking, make the mousse. Place peanut butter, cream cheese, vanilla, and milk in a large mixing owl. Beat with an electric mixer until smooth and fluffy. Add powdered sugar and beat until smooth. Set aside. Place whipping cream in a second bowl. Beat until whipped cream holds stiff peaks. Working in 4 batches, gently fold the whipped cream into the peanut butter mixture to form a light, airy mousse. Over working the mousse will cause it to deflate, so use a light hand! Scrap the mousse into a gallon size ZipLoc and place into the refrigerator to cook for one hour. Carefully place the brownie onto the plate you wish to serve your pie on. Remove mousse from refrigerator. Cut about 1″ off of the corner of the plastic bag. Evenly pipe the mousse over the brownie in large spiraling circles. Use all of the mousse. With a rubber spatula, smooth out top surface of mousse. Place the brownie and mousse into refrigerator to chill at least 30 minutes before finishing. While the brownie and mousse are chilling, make ganache. Place 1/3 cup whipping cream into a small sauce pan over medium-high heat. Bring to a simmer, stirring frequently. Remove from heat and add chocolate. Let chocolate and cream sit about 3 minutes. Whisk until smooth and shiny. Leave at room temperature until ready to finish pie. Remove pie from refrigerator. Sprinkle chopped Reese’s cups evenly over the top of the pie. Drizzle with ganache. This pie must be served chilled or mousse will deflate. May be stored in the fridge for 3 days. Freezes well and can be eaten straight from freezer. OK–two confessions. One, I just found this post. Two, I came home from work and was standing at the counter eating peanut butter from the jar with wheat thins. Obviously, this is a perfect recipe for me! MMMM Wheat thins and peanut butter! I hope you try this recipe out 🙂 Thanks! Oh yummy all my favorites in one dish! Wow this looks fabulous! Anything with peanut butter mousse and ganache is a winner! I would like to use this pie as a dip for peanut butter cups! This sounds so good. I’ll take TWO! I’m glad you posted this because I need something to make for this Saturday. It’s a Halloween party. Some people may not think this pie is scary, but my other half hates peanut butter. (More for me!) It will be plenny scary for him and I can eat his piece! If you ended up making this, let me know please! I’d love to share a link on my blog. Thank you! Peanut butter and chocolate brownies! Now who can say no to that? Definitely not me 😉 Thanks!